Broken arms. Fractured legs. Broken ankles, fingers and wrists. Bone breaks and fractures are fairly common and range in severity, as well as length of treatment needed. A broken bone isn’t always a simple injury that a cast and some rest can fix. These harms can also result in injury to the surrounding ligaments and tissues, even leading to nerve damage that can cause excruciating, chronic pain. Depending on the type of work you do and the bone you break, you can also lose thousands of dollars from lost work or even diminished earnings capacity going forward. If you or a loved one has suffered a bone fracture in an accident caused by someone’s negligence, you can seek compensation for your injury. 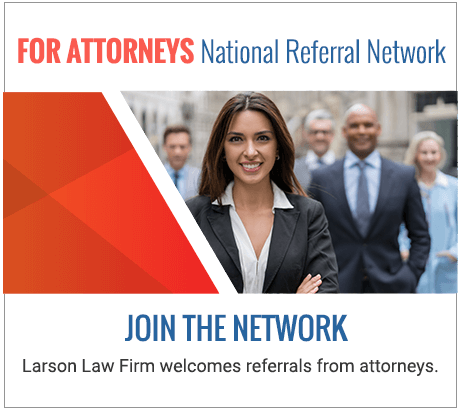 The skilled North Dakota personal injury attorneys of Larson Law Firm P.C. have more than 35 years of experience and a record of success fighting for maximum compensation for injured victims. While bone fractures are most commonly caused by car accidents and falls, stress fractures — which result from repeated stress and strain — may also occur. Children are more prone to bone breaks and fractures due to their high level of physical activity, while older individuals are more susceptible to bone fractures because healthy bones become weaker as the body ages. When you secure the legal team at the Larson Law Firm, we first set out to identify the cause of your injury, as well as all responsible parties. We then present your case to the other side and strategically work towards a fair settlement amount. If we are unable to reach an agreement, we will work with you to determine whether litigation is an appropriate next step. The severity of your injuries. Did you have a simple break that was treated with a cast and periodic medical care? Or did you have a complicated break that required multiple interventions and ongoing rehabilitative care? Medical expenses. The cost of your medical treatment will be the foundation for your injury award. If doctors say that you will need ongoing care, such as for rehabilitation, the cost of that care will also be included. Lost wages. If your broken or fractured bone injury affected your ability to work, your lost wages can also be included in your settlement. In most cases, you will only lose work to get medical care or to heal from your broken bone. However, with more serious injuries, you may lose your ability to work in the same capacity for months or even years after the accident. Each personal injury case is unique, so there is no way to quantify what you can expect until we analyze your case and begin collecting evidence. At Larson Law Firm P.C., our knowledgeable attorneys aggressively fight to secure the compensation you deserve for a broken or fractured bone injury. We primarily work from our office in Minot, but we also represent clients throughout Ward, Williams, McKenzie, Pierce and Mountrail Counties. Complete our contact form or call use at 701-484-HURT today to arrange a free consultation.